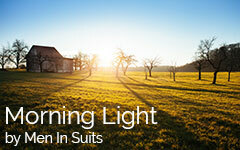 Men in Suits releases it’s new song, Morning Light. Written by Don Tapscott in collaboration with John Welsman and Duke Mackenzie. Vocals by Gerry Throop, Trish Fondberg, Duke Mackenzie and Don Tapscott. Stay posted for the video contest. It’s an anthem for social change. “She” represents people who through love can collectively build a better world using the power of the Net. The first part is 60’s then into a 2013 hip hop — leading back and forth to crescendo. We’re asking a Marquis Rapper to do the hiphop — stay tuned for an announcement. There will then be contest on the Internet to do the music video with a significant prize. All proceeds will go to a charity. Men In Suit’s Latest Release!